I went to this chapel last Saturday and took some photos after confessionals were done and the patrons had left. 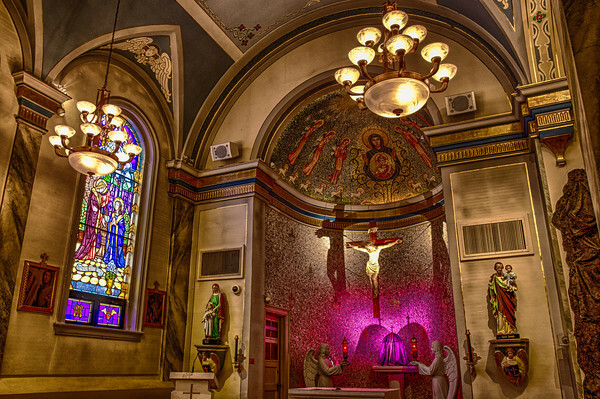 It’s from the Church of Saint Louis King of France in St. Paul, Minnesota. The lighting was wonderful but after HDR processing the magenta was extremely strong and oversaturated. I often see the color red way too strong in photos too. With HDR details are normally brought out and having an oversaturated color can cover up the detail we are trying to show. Above you see the magenta is very strong. 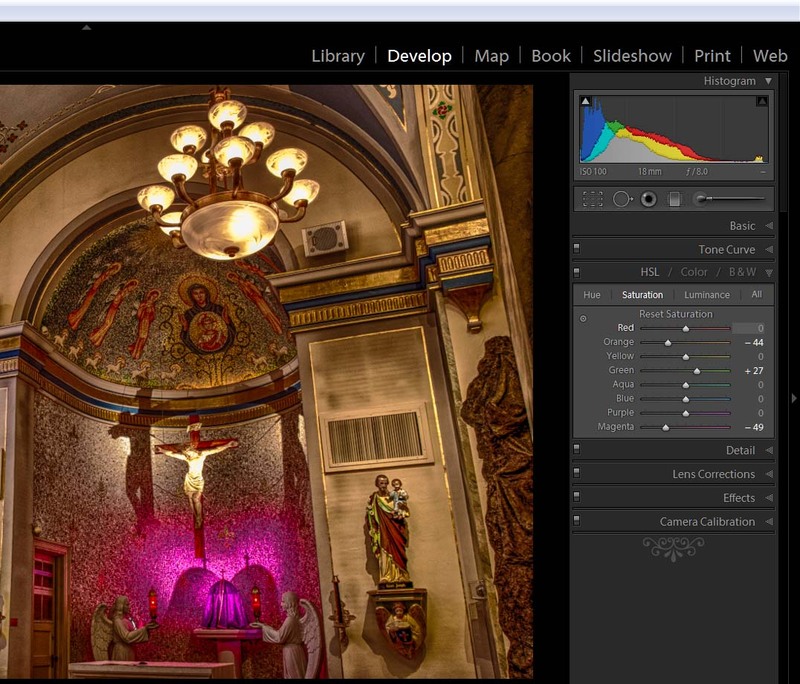 Instead of reducing the saturation or vibrance I target the magenta saturation in the HSL (Hue, Saturation and Luminance) sliders in the develop panel in Lightroom 4. You can also play with the luminance that can make the color darker or brighter and affect the perceived saturation. This tones down the magenta and leaves the other colors alone. Here’s the finished photo and you can see the shadow detail is better. At first the oversaturated photo may look like it pops more but it can become fatiguing and obscure some of the finer details. Just be careful it doesn’t affect other areas of the photo too much like the stained glass would be a concern in this photo. If it does the adjustment brush could be used to reduce saturation locally instead. I just find that can a bit more tedious at times. Note: I also reduced the orange saturation. I often do this with interior shots to remove the ugly orange cast from artificial lighting.